Abstract : The main body of the Chinese part of the first cross-river railway bridge connecting with Russia was completed Saturday, the construction contractor said. HARBIN, Oct. 15 (Xinhua) -- The main body of the Chinese part of the first cross-river railway bridge connecting with Russia was completed Saturday, the construction contractor said. Chinese workers put in place the last steel beam to connect bridge pillars on Saturday morning. 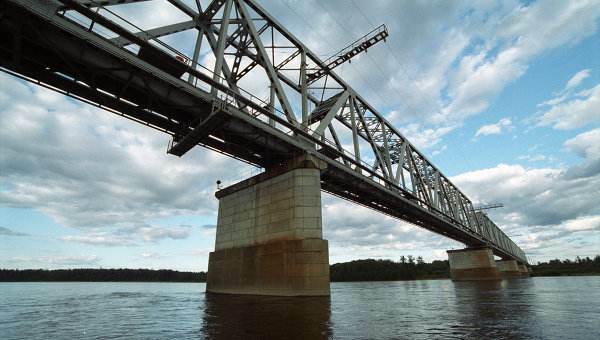 The bridge across the Heilongjiang River, known as the Amur River in Russia, connects the city of Tongjiang in northeast China's Heilongjiang Province with Nizhneleninskoye in Russia. The main bridge spans 2,215 meters, with 1,886 meters of that standing in China. Beginning construction in February 2014, the bridge has a designed annual throughput capacity of 21 million tonnes. Liu Weiquan, head of China's bridge construction headquarters, said the Chinese side only has a small number of railway tracks to lay before full completion and the Russian side is also speeding up construction. The bridge is expected to add another major transportation corridor between China and Russia and help Heilongjiang Province take advantage of the Belt and Road Initiative to boost local economy and trade. "After the railway bridge is put into operation, we can import all through the year, and this is also expected to reduce transportation costs by 100 yuan (14.5 U.S. dollars) per cubic meter of timber," Xu Zhaojun, owner of a timber importer in Tongjiang. Song Kui, president of the Contemporary China-Russia Regional Economy Research Institute in Heilongjiang, said the new route will boost bilateral logistics, providing a further impetus for economic cooperation between the two countries. In the first half of this year, Heilongjiang saw trade with Russia go up 48.2 percent year on year to 53.4 billion yuan (7.7 billion U.S. dollars). China has also become the largest trading partner and source of foreign investment for the Russian Far East.